First class meeting. Exam binocular imagery via various vintage and contemporary stereoscopes. Take a look at Brian May’s book of vintage stereo cards, Diableries: Stereoscopic Adventures in Hell, and Barry Rothstein’s book of phantograms for children, Pop-up 3D. Conduct a brief discussion and demonstration on depth perception via both binocular and motion parallax. Comments on the primary differences experienced with fixed POV stereoscopic displays versus the interactive parallax provided via the variable POV of head tracked HMD’s etc. Take part in individual and group experiences of CalArts Alum Glen Keane’s illusory 360º drawn animation movie Duet, as shown on a Moto X Gen 2 smartphone via Google Spotlight Stories. Discussing the empowered point of view of the person holding and moving the phone led to a mention of Jeffrey Shaw’s privileged POV tracking robotic arm stereoscopic dome projection artwork EVE. A look at the course website from previous years as an example of what topics students might decide to pursue this year. A cursory stereopsis perception test conducted via a random dot stereogram displayed on a Google Cardboard 2 stereoscopic viewer. Brief demonstration of how to view 3D playback from the computer workstation connected via an HDMI connection to the Vizio 47″ passive 3D monitor mounted on the lab wall. Screening of Part I, Part 2, Part 3, and Part 4 of Brian May’s brief History of 3D. Second class meeting. A demonstration and hands on workshop utilizing the NYPL hosted stereopticon card collection and their online Stereogranimator program. This interactive viewing program provides a direct means for comprehending the way that the shifting of congruent points in a stereoscopic image pair determines the zero parallax plane (as experienced through the flickering alteration of left and right viewpoints known as wiggle stereoscopy). View Jack Smith tumbling from an excerpt from one of Ken Jacobs‘ original Nervous System film-performances: Two Wrenching Departures. A brief discussion of Jacob’s development of “the propellor” based upon his friend Alfons Schilling‘s rotating shutter device and a quick look at the course page on Jacobs and his art. A short demonstration of the principles of stereoscopic photography with a single lens camera (a Moto X Gen 2 Android Phone) via the horizontal-shift/sequential-shot technique known as the cha-cha method. Students work with Masuji Suto’s StereoPhoto Maker using previously shot cha-cha image pairs located in the class folder on the server. View a YouTube 3D slide show movie of 2012’s end of semester Course Exhibition in the B&W studio gallery A404. View Tole Mour VOTF 12: Blue Whales Across the Bow, and Tole Mour VOTF 12: Endless Sea Lions, as examples of Stereoscopic GoPro video shot using the GoPro 3D rig available from the School of Film/Video equipment cage. A brief demonstration on the operation of the GoPro 3D rig to be followed up with more extensive hands on experience and addition to the cage check out list for the rig the following week. Third class meeting. Brief introductions including descriptions of individual areas of interest in stereoscopic imaging. Discuss ideas for upcoming weekly topics. View and discuss excerpts from Ken Jacobs’ Capitalism: Slavery, and Capitalism: Child Labor digital nervous system performances. Jacobs utilises a method related to the techniques we have used in the creation of wigglegrams via the NYPL site. Further discussion of the method Jacob’s employs to direct the viewer’s gaze upon particular aspects and individuals in the scenes by slowly shifting the horizontal positioning of the images so that homologous points align at zero parallax –thus minimizing flicker induced motion at those points. A discussion of how the use of black frames between the flashed image frames differs from simply alternating the images (and of how this stems from his live nervous system performance work with the “propeller”. Free-viewing of stereoscopic pairs via the cross-eye free viewing technique demonstrated by vocaloid characters Hatsune Miku (with Red rather than Cyan hair in an oblique reference to anaglyph 3D), and Kagamine Rin in a very kawaii instructional video by Terry Hor. After the break, students shoot cha-cha images with either their own or provided cameras. Students load Cha-cha stereo image pairs into StereoPhoto Maker and experiment with editing and display modes (including the glasses free wigglegram and cross-eye free viewing methods). During the individual work with SPM, small groups of students break away for a demo and hands on experience with the GoPro 2 cameras, aspects of their setup, and their use in the GoPro 3D rig with the goal of being approved for cage being check out of the 3D rig. Fourth class meeting. Some students share results of their cha-cha experiments as edited in class the previous week. An exploration of the Pulfrich Effect (first described and demonstrated by stereographic researcher Carl Pulfrich in 1922) and its relation to the cha-cha and wiggle method of stereogram creation. A performance demonstrating Pulfrich’s pendulum experiment, followed by a viewing of Todd E. Gaul’s classic video, Demonstration of the Pulfrich Effect: NC State Fair. Viewing of many other examples including Jim Ellis‘ Pulfrich 3D work, Scroggins Beach, and my first CG animation film, 1921>1989 which was created to be stereoscopic, but for which only the left eye render exists. Elements in Santiago Caicedo’s film Moving Still (Moving Still cross-eye) were shot from a moving train in order to exploit stereoscopic motion parallax to create a hybrid live action and stereoscopic CG animation film. The extraction of stereoscopic pairs from that lateral motion of the train is directly related to both the cha-cha method of shooting 3D images and the Pulfrich Effect. A diagrammatic breakdown of his process is available in French (auto-translatable into rough English via Google translate) on his 2008 website. Please note that in his diagrams C.G. refers to Caméra Gauche (left) and C.D. refers to Caméra Droite (right). Norman McLaren also used a technique based on a variant of Pulfrich’s discovery wherein he used a one frame temporal offset of filmed oscilloscope Lissajou patterns to construct the left and right frames in his optically printed 1951 stereoscopic film Around is Around. Fifth class meeting. Ben Reicher screens the full stereoscopic version of his most recent film, Valor Cat, and discusses the challenges involved in realizing the project (modeled, rigged, animated, in 3D CG via Autodesk Maya). Ben then conducts a demonstration of stereoscopic depth adjustment using variable horizontal disparity values via multiple compositions in Adobe After Effects. Unlike 3D CG or live action film, stereoscopic stop motion work is typically shot via a process akin to the cha-cha method of stereoscopic still photography. The objects being animated are moved into the desired position and then a single camera mounted on a motion control rig is used to shoot the left image, the stepper then moves the camera to the right and shoots the right image. On some projects the camera continues taking one or two shots further to the right of the initial image in order to have the choice of editing with multiple interaxial distances. Multiple interaxial distances are useful in the creation of versions optimised for exhibition on the wide range of 3D screen sizes now available. Jamie Caliri used a pre-release version of Dragonframe to run several months of art direction tests on Henry Selick’s stereoscopic stop motion film Coraline. A demonstration on shooting stereoscopic stop motion with the Mark Roberts Motion Control S3 Stereoscopic Stepper via Dragonframe and the Canon 50D DSL followed by students taking turns shooting brief animation tests with the Stereoscopic Stepper system. If time permits there will also be small group demonstrations on the editing of stereoscopic video pairs in Adobe Premiere using Tim Dashwood’s Stereo3D Toolbox plugin. The MRMC S3 Stereoscopic Stepper functions similarly to the experimental prototype rigs used to shoot Coraline in 3D (shown mounted on a multi-axis moco rig in the image below). Sixth class meeting. A demo combining the use of the Kinect for Windows v2 depth camera and Brekel Kinect Pro Body v2 into MotionBuilder and MoBu’s Sterescopic toolsets. Brief review of the differences in the GoPro 3D and Mark Roberts Motion Control S3 for shooting stereoscopic live action and stop motion. An explanation of rolling versus global shutter in relation to synchronising a pair of video cameras for stereoscopic capture. A look back at Latrique’s classic race car photograph as an example of focal plane shutter in a film camera and its relation to the rolling shutter of some digital cameras (a mathematical analysis of the phenomenon was not covered in class). This led to a sidetrip to view CalArts alum Greg Ercolano’s recovery of the original plate source images for the slit scan effect in the Star Gate sequence in Stanley Kubrick’s film 2001: A Space Odyssey. A discussion and demo of shooting side-by-side video with a pair of un-synched Canon XA10 HD video cameras mounted on the Redrock Micro 3D SxS stereoscopic support rig. The left and right image sequences shot in class were then loaded into Premiere Pro CC 2016 on the stereoscopic editing station at the front of the lab and a hands on demonstration of stereoscopic syncing and editing with the Dashwood Stereo3D Toolbox plug-in was made (despite several crashes due to bugs with our version of Dashwood’s plug in). Seventh class meeting. A PPT presentation of Aspects of Monocular and Binocular Depth Cues (which makes no reference to the nature of chromostereopsis). That presentation was followed by a demonstration and description of the nature of chromostereoscopy and development of the Chromadepth process. Viewing and discussion of two video interviews with artist, actor, and writer, Leigh McCloskey provided some insights into his expanded chromostereoscopic painting, The Hieroglyph of the Human Soul. 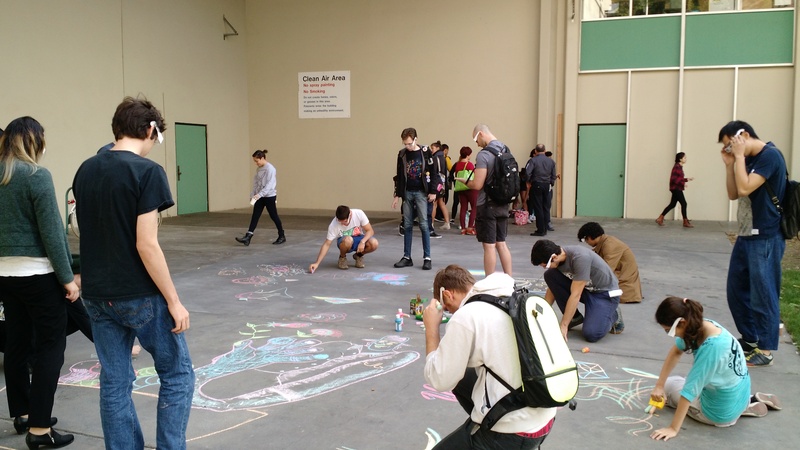 The viewing of a vintage 30 second Crayola 3D Sidewalk Chalk commercial spot, Welcome to My World, was followed by a visit to the G-Lab Courtyard to experiment with drawing on the pavement with pieces from a Crayola 3D Sidewalk Chalk kit while wearing Chromadepth glasses. After the chalk drawing we returned to F105 where Ben Reicher demonstrated using color ramp shaders in Maya to generate chromostereoscopic depth in 3D CGI. For the remainder of the class session students experimented creating chromostereoscopic imagery with Photoshop, AfterEffects, and more. Visiting Artist and CalArts alumna Christine Marie stopped by class after her workshop in the School of Theater to present a comprehensive look at the development of her work in anaglyph shadow projection. We viewed a stereoscopic slide show of Ray Zone‘s 2011 visit to the class where he presented a talk on the history of Laurens Hammond’s Shadowgraph work and shared in visiting artist Amy Halpern‘s demonstration of anaglyph 3D shadow play based on her work with Ken Jacobs in the Apparition Theater of New York. We then movde up to the Black & White Studio in A404 to work with Christine Marie in experimenting with 3D shadow projection techniques. Ninth class meeting. The afternoon started with a guided tour of the course page on 3D Drawing and Painting. Later, visiting Artist Eric Kurland presented an overview of stereoscopic 3D including his work as stereographer for the band OK Go on several pieces including All is Not Lost with the Pilobus dance company. Eric also spoke about the technique of 2D to 3D conversion employed by Ray Zone for 3D comic books as well as Eric’s own approach to 2D to 3D conversion on the Simpsons episode The Longest Daycare. In the remaining minutes of the class Eric and I talked about the nature of Phantograms while I quickly set up a Phantogram shot with my Fujifilm W3 for processing later with the Easy Create Pop-up Anaglyph function in Masuji Suto’s StereoPhoto Maker. Tenth class meeting. A catch up day. General topics: TBD. Specific topics: issues and questions related to the creation and completion of work to be installed in the end of semester exhibition scheduled to open in the B&W Studio Gallery A404 on Thursday evening, December 3, 2014. Eleventh class meeting. Install end of semester exhibition in the B&W Studio Gallery A404.